The state-of-the-art speech-recognition product for the Mac improves markedly, but there are also gaping holes where it needs improvement. My first Dragon for Mac 5 installation experience wasn't pretty. I've been using Nuance's Dragon for the Mac for several years and experience has taught me that with any major new version of the product, it's prudent to wait two to three weeks for the inevitable minor revisions in hopes that the program will become a bit more refined. Unfortunately that wasn't the case. In a moment, I'll circle back to that story and what I finally did to get Dragon for Mac 5 installed properly and running well. In fact, I've come to admire this version of the program. While there is plenty to pick at, overall Dragon for Mac 5 is a very worthwhile upgrade. It would also be a great place to get started on dictation if you've been waiting in the wings. 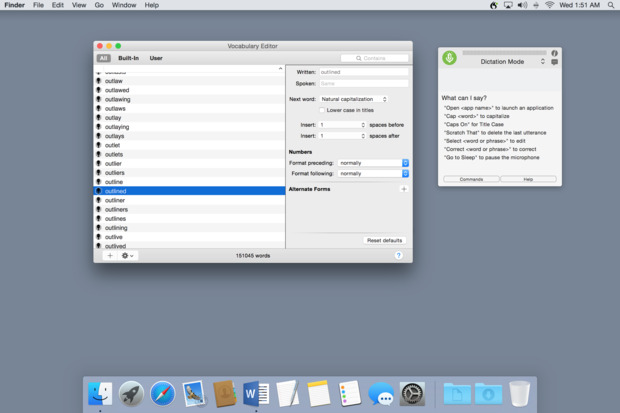 Dragon for Mac 5 was introduced in a Nuance webcast on August 18. The company introduced several new products targeting Windows and Mac users, mobile users and enterprises. Plus there's a new central administration tool called Nuance User Management Center that manages licensing and shared customizations. The enterprise product is called Dragon Professional Group. The company also announced a new cloud/mobile product called Dragon Anywhere, which is due to be released in the near future. It's part of the enterprise solution Nuance is offering, but it will be of interest to individual users as well since it will let you sync multiple installations of Dragon, across platforms. I intend to test and write about both Dragon Professional Individual and Dragon Anywhere. But for now, back to the Mac product. Nuance's chief claims for the new version of Dragon for Mac include a 15% increase in dictation accuracy and performance improvements. Nuance also completely overhauled the user interface and changed the paradigm from application to operating system service. Dragon for Mac 5 no longer sports a traditional Macintosh set of application menus. Many of Dragon's functions are voice directed, but the complete point-and-click user interface is accessed via a single drop-down menu from a tiny Dragon icon on the right side of the Apple menu bar. Dragon for Mac 5's one and only menu. It's compact but there's nothing missing. Dragon 5 looks very very different from its predecessor, but they have most of the same controls and settings. In fact, most of the functions are identical or similar to those of Dragon Dictate 4. It looks very different from that previous version, but feature for feature, it's functionally very similar. In use, it's a tad reminiscent of Dragon NaturallySpeaking for Windows. I think it's smart for Nuance to nudge the Windows and Mac versions closer together. Despite the apparent user interface differences, the most the important changes are under the hood, including an update to the speech-recognition engine. Dragon for Mac 5 is also pleasantly, noticeably fast. Commands are carried out effortlessly. The performance improvement goes a long way toward brightening your outlook toward the application. Its accuracy rate is appreciably improved out of the box. On the other hand, the new corrections facility is great when it works but it doesn't operate reliably. The main way to improve accuracy in Dragon is by training it with your corrections. So if they can fix corrections, Dragon 5 could become even more accurate. There are a lot of good things about Dragon for Mac 5. However, the new way it handles the implementation of corrections is not one of them. It's not the concept or design that is errant. It's just plagued by bugs. I consistently encounter the same set of functional errors, making it difficult to reliably make a correction. Corrections are supposed to work like this: You're dictating along and you get a word that takes the wrong form, is misspelled or wasn't the word you were looking for. To remedy the problem, you tell Dragon "Correct that" or "Correct xyz" (naming the incorrect word or phrase). Dragon pops up a numbered list of suggested corrections. If the correct word is on the list, you issue the command "choose #" (# representing the corresponding number). Dragon then replaces the incorrect word or words with those you chose from the suggested list. Positive outcome. Problem 1. Dragon has trouble displaying its suggested corrections. They appear in a new box called the Status Window. The window is supposed to expand automatically to accommodate the number of suggestions Dragon offers, but it frequently does not expand large enough (or expand at all), leaving several suggestions obscured from view. The Status Window showing only three of the eight suggested corrections it offered for the command "correct bug." Let's say Dragon is offering five suggested corrections. It's not uncommon for the Status Window to display only three of the five recommendations (typically the third, fourth and fifth suggestions). The first two are there -- you just can't see them because the status window didn't expand tall enough to display them. The Status Window won't let you scroll the suggestions so you can see the ones that aren't visible or allow you to drag the edges or corners of the Status Window to make it taller or wider. Adding the ability to manually expand the box would be a useful fallback option. You can sometimes tease out all the corrections by clicking the Information button on the right side of the Status Window, but about half the time you find yourself unintentionally blanking out the correction suggestions. I see this error about 65% of the time that I attempt to make a correction. The other 35% of the time the Status Window automatically expands to display four, five, six, seven -- however many suggestions Dragon is offering. That's when you can run into the second problem. Problem 2. Using the command "Choose 3," for example, to insert the third correction does not work reliably. About 60% of the time, Dragon thinks you're dictating words for display -- so it inserts them. What you see in your document is your uncorrected error followed by "choose 3." That never happened in the previous versions of the product. The bug even occurs in command mode. After you issue a "correct" command, Dragon should always expect that when the word "choose" follows, it's a command -- not a dictation. Problem 3. Homonyms-- words that sound the same but are spelled differently -- create a unique problem for the Dragon 5 corrections process. The Windows version of Dragon has a useful solution for handling this that also gives you a way to control nearby identical instances of the word you're trying to correct. It displays small numbers in colored boxes just to the left of the possible words you might be trying to correct; you then voice the number of one you want to fix. Until Dragon for Mac has something like that, we'll struggle along with this problem. Unfortunately, in version 5 the situation is worse rather than better. I encountered a good example of a no-win situation when I dictated "I liked that version too." Dragon interpreted that as "I liked that version 2." When I tried to correct the "2," the program bounced up into the document and found a nearby "to." When I tried to correct by saying, "Numeral 2," it bounced up several paragraphs, finding a "2" there. Even when I issued the command "Correct version 2," Dragon could not select the phrase directly preceding the cursor. In the end, I had to resort to typing to solve this problem. And this happens a lot with specific words: "to," "two," "too" and "2" are frequent adversaries, but there are others. A feature in Dragon Professional Individual for Windows that Dragon for Mac lacks: In response to the command "Correct two," the software identifies numerous possible words to correct in the vicinity of the cursor. All you have to do is announce the number of the one you want to correct and then choose the appropriate correction from a list. An additional (and undesirable) outcome of this collection of correction-related issues is that, because I'm not successfully executing corrections at anything approaching the rate I did with previous versions of Dragon, I'm also not training Dragon 5 efficiently. In Dragon Dictate 4, corrections-based training was one of the best ways to build accuracy. One thing you can do in Dragon 5 is correct a word by dictating a word to replace it. That works pretty well most of the time, assuming that Dragon knows the word already. Nuance needs to find a way to fully support switching back and forth between typing and dictation in email products, such as Microsoft Outlook and Apple Mail. Dragon supports that activity in Microsoft Word and Apple's TextEdit -- but most business people spend several hours a day working in email and messaging applications. The Dragon for Mac user experience is trying in that scenario. Accuracy drops precipitously and there is the constant need to issue and reissue Purge Cache and Cache Document commands -- or worse, the Cache Selection command. These commands reintroduce forgetful Dragon to the words already on the page. It's like the application is blindfolded. Speech-directed navigation within a document is also clumsy and painfully slow. As a result, you wind up dictating into Word or TextEdit and then copying and pasting into your email package. It's not elegant. To be fair, I don't think this is all Nuance's fault. The applications must bring something important to this interplay too if dictating email is going to be a pleasant and fruitful user experience. Jeff Leiman, senior engineering project manager at Nuance, posted in his company's public forums about a third-party application's role in creating a good dictating environment. "In OS X, applications can't step into each other's spaces; they have to communicate with each other. In newer versions of OS X, these rules have become more strict," he explains. In addition, he wrote, "Microsoft Word 2011, Microsoft Word 2016 and TextEdit allow you to mix talking and typing because those applications allow Dragon to see what you're doing [with the mouse and keyboard to change cursor position] so we can keep track of where things are on screen. Other applications don't tell Dragon about changes you make by hand and it can seem like Dragon is confused as to where the cursor is." Microsoft Outlook and Apple Mail are among the "other applications" that don't communicate back to Dragon about cursor location. Up top I said I would come back to what happened the first time I installed Dragon for Mac 5 and the steps I developed to foster a reliable, fast Dragon 5 installation. Dragon has a reputation for not making it through upgrades very well on the Mac. The problem is compounded by the fact that people put a lot of time into building and customizing their Dragon user profiles. Frequently, it's those old user profiles that put the upgrade at risk. But because those cozy old profiles worked so well in the previous version of Dragon, people are loath to part with them when they upgrade to a major new release like Dragon 5. Performing a clean install is definitely the right approach. I proved that to myself with my first installation attempt. You see, I tried to take a shortcut. I went with the upgrade installation of Dragon Dictate 4 with the twist that I removed my DD4 profile in advance, creating a fresh user profile in Dragon 5. But the software debris left over from the Dragon Dictate 4 installation was more troublesome than I expected.